A brush pile can add instant shelter to your backyard bird habitat without needing to plant, prune and care for trees or bushes. Adding brush piles to your property is also a way to practice effective habitat conservation by reusing materials rather than sending them to a landfill. To build a brush pile that will last for years takes more than just tossing branches into a corner of the yard. By planning carefully and constructing the pile with the birds in mind, birders can easily add shelter to their backyard habitats. Brush piles are not the most attractive bird shelter. They should be placed carefully not only to be welcoming to the birds, but so they do not present an unwelcome eyesore to the homeowners or neighbors. Choose an unobtrusive location that offers some shelter from prevailing winds – at the side of a garage or behind a shed, for example. If the pile will be visible from the street, contact city officials to ensure that brush piles are permitted. When choosing the pile location, also consider nearby features such as the proximity of bird feeders, water or other landscaping that will attract birds and entice them to use the pile as shelter. Any size sticks, twigs and branches can be used for a brush pile. Ideally, larger branches will be more useful to keep the pile stable, while smaller branches provide ample perching spots for birds. Piles can be made with branches from different types of trees, and leaving pine needles or leaves on the branches will help provide more security for hesitant birds, as well as better shelter in poor weather. The ideal size for a brush pile is approximately 8-10 feet long and 4-5 feet tall. It can take a great deal of brush to create a pile that large, and using a fallen log, stumps, old wooden furniture or a few well-placed boards can help augment the pile. Easily compostable materials such as leaves and grass clippings should not be used to build a brush pile. These materials will clog entrances to the pile and make it less attractive to birds. Adding some of this material to the base of the pile, however, can offer ground birds nesting material, and leaf litter can attract birds with food and water. To build the brush pile, start by creating a horizontal frame of thicker logs or branches for stability. Leave holes along the edges of the frame to provide access for ground birds such as quail or pheasants. For larger piles, consider digging small trenches so the framework is more solid. Next, create a cone shape with large and medium branches, bracing the bottoms of the branches against the solid frame. Small holes can help brace the largest branches. Finally, weave smaller branches into the pile, creating layers of shelter and perching spots. If the pile is not naturally sheltered, use additional branches to create a thicker side to provide protection from prevailing winds. A brush pile can be made more attractive by planting blooming vines nearby and allowing them to climb the pile over time. To keep the pile attractive to birds, the vines will need to be trimmed periodically so they do not collapse the pile or close off entrances and exits. Even the most stable brush pile will eventually settle and collapse as its branches slowly decompose. 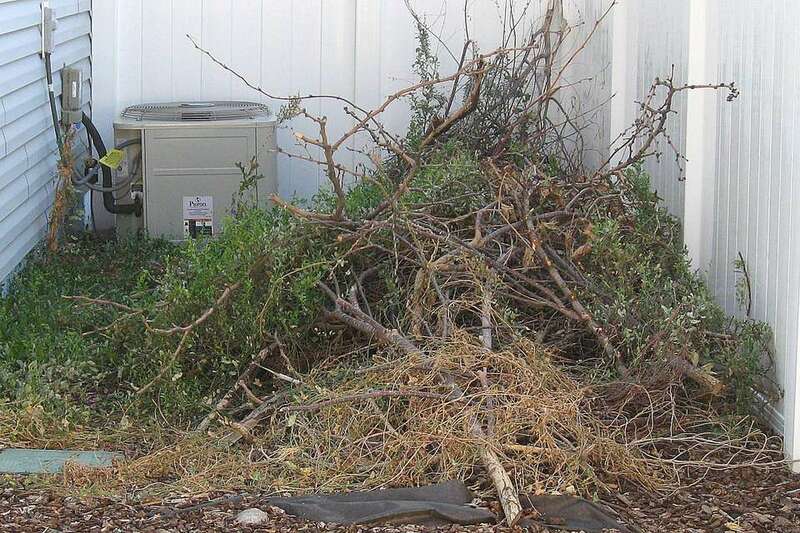 To keep a pile useful as long as possible, periodically trim climbing vines or weeds that are exerting stress on the pile’s support and add additional light branches on top of the pile to maintain its height. Adding stronger supports as time passes will also help strengthen a brush pile. A brush pile can be an easy addition to a bird-friendly backyard, and by building it carefully, a brush pile can attract birds for years.